Pat Summitt, coaching the University of Tennessee women’s basketball team during a semifinal game of the NCAA tournament in 2008 in Tampa, Florida. That last number seems especially lofty, because there aren’t many women winning D-I titles as a coach these days: During the 2014-15 school year, only five of the 17 women’s Division I team championships were won by teams with female head coaches. Overall, 40.2 percent of head coaches in women’s NCAA athletics last school year were women, and that number falls to 38.9 percent at the Division I level.Women’s basketball has consistently been among the best sports when it comes to female representation in the coaching ranks. Last season 58.6 percent of Division I head coaches were female — no other sport with at least 300 Division I programs had a majority of female head coaches. *With minimum 300 programs in U.S. 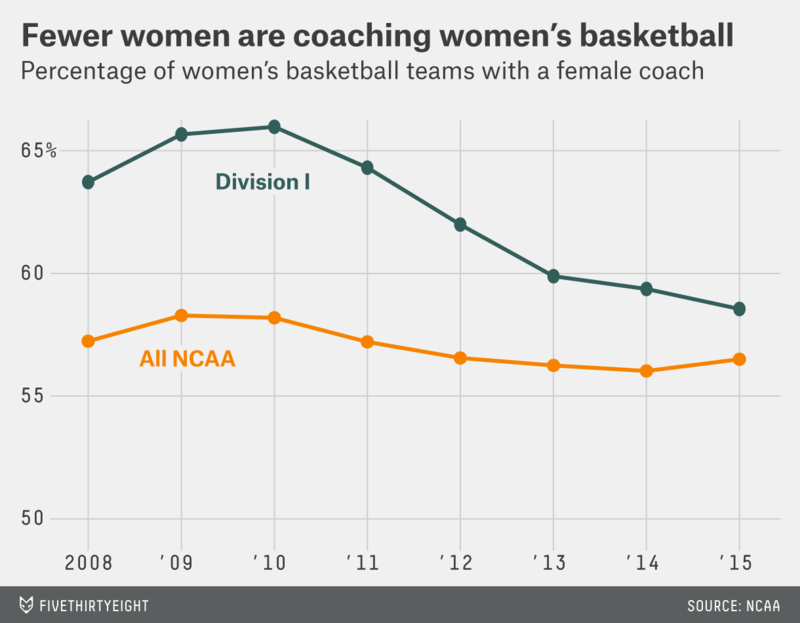 Yet while women’s basketball succeeds relative to other major sports, the percentage of female head coaches in the sport has actually been declining over the last five seasons, both overall and most severely at the Division I level. In the 1996-97 school year — the first season in a streak of three consecutive national championships for Summitt and the Lady Vols — 62.3 percent of head coaches in women’s Division I basketball were female. That number rose to 66 percent in 2009-10 but has declined ever since. As the number of women’s programs increases, the number of female head coaches has decreased. In the 2007-08 school year there were a total of 329 women’s basketball programs in Division I and 209 female head coaches. Last school year, there were 343 programs but only 202 women in head coaching positions. Seven of those 14 new D-I programs had female coaches when they made the switch. Indeed, the difference appears to be in opportunity. Sixty percent of women’s Division I head coaches last season were men, while only 3 percent of all men’s coaches were women.And like most industries, the percentage of women in authority positions continues to fall the higher you move within an athletic department. Across all of Division I athletics last school year — men’s, women’s and coed sports alike — 37 percent of assistant coaches, 35 percent of head coaches, and just 9 percent of athletic directors were women. That figure is up from just 7 percent in 1995-96, but has remained around 9 percent over the last five seasons. When Title IX was enacted in 1972, more than 90 percent of women’s college teams were coached by women.3 Forty-three years later, that number has fallen to 40 percent. With the number of women’s athletic programs higher than it has ever been, progress on the sidelines has fallen well behind the standard set on the court. Suzanne Yoculan (University of Georgia gymnastics – 10), Beth Anders (Old Dominion field hockey – 9), Marsha Beasley (West Virginia University rifle – 8), and Cindy Timchal (University of Maryland lacrosse – 8). Study by Acosta and Carpenter’s Women in Intercollegiate Sports. MC Barrett is a researcher in ESPN’s Stats and Information Group.